About Karie: I'm originally from Coloma, MI and moved to St. Joe because I love the area. I have three amazing children, a fiance, three dogs and a cat. Outside of the gym, I hand out with the kids and go for walks around town. In my free time (which doesn't happen very often) I love going to consignment shops or garage sales and finding fun furniture to restore or different craft projects from Pinterest. 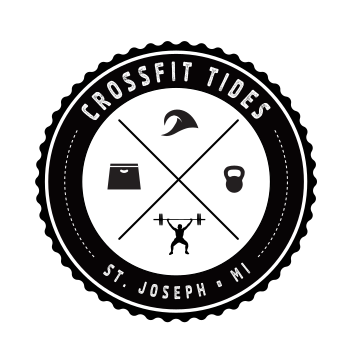 How you started at CrossFit Tides and what made you transition into coaching: I started CrossFit style workouts at home using space in my basement then moved out to the driveway. I'm sure my neighbors think I am a little out there but I was having so much fun! I have thought about coaching for over a year. When I would workout with friends or family, it was fun to teach them the functional movements we use every day. The smile on their faces when they could lift more weight than what they thought or just move the way that they did, it make me feel good knowing I helped them. My favorite part of being a coach is… Seeing that lightbulb turn on when people are aware of the way they can move their body. To see people come in knowing its a more challenging WOD and are super happy on how well they did. To see more self confidence in what they are doing is absolutely amazing. It can be anything from running a bit faster or lifting more weight, getting pullups or finally nailing double unders. You can really see a difference in someone once they believe in themselves. It's what CrossFit does for people. It helps you move better in everyday life and boosts self esteem. It's a great feeling to know what you teach people in class physically and mentally changes people for the better. To have a healthy life. Favorite WOD: I really like WODs that are in honor of someone or something. I always push myself a little bit harder. It can be a fallen soldier or a family member or close friend or even and event that happened in the past. Go-to Healthy snack: Nuts. I love pecans, pistachios and smoked almonds. Cheat day favorite: I have a terrible sweet tooth, so almost anything chocolate like brownies with ice cream or monster oatmeal M&M cookies. If I am not at CFT you can find me: Hanging out at home. Trying to keep up on house work that never ends. I love watching TV but don't have a lot of time to actually sit down and watch.